One of the things that makes bartlett mitchell stand out as a contract caterer is that we are passionate about developing our people. The letter O stands for ‘Obsessive about our people’ and is the first ‘O’ in our ‘Foodies’ values. A bartlett mitchell team member is a passionate foodie who is trained and supported to deliver the very best service. 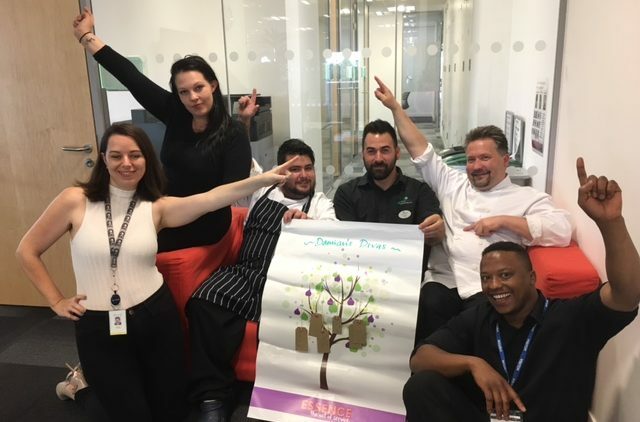 One of the ways we achieve this is by investing in our teams using our customer service and team building development course called ‘Essence’. Devised exclusively by the Royal Central School of Speech and Drama, Essence is an interactive, hands-on training program which develops both individual and teams. Essence aims to develop skills in communication, teamwork, confidence, presence and professionalism. All teams participate in this course outside of their normal work space, enabling them to engage, laugh and learn, using specially designed games and exercises. Tools are provided to help the teams handle all types of workplace scenarios and provide an opportunity to ask questions and learn about best practice. Understanding different energy levels in customers and teams alike is another important way to empower people to work well in a customer service environment. Dealing with stress and learning awareness exercises help build skills in how to listen effectively and work in harmony within an often fast paced, busy service environment. Food service and the catering sector has always attracted an international workforce and sometimes cultural and language differences are challenges. Essence is one of the tools we use to overcome these challenges so that team members have opportunities to feel confident and grow and develop their careers. The confidence instilled by Essence training empowers team members which allows them to openly share ideas in our weekly Team Talks. This setting is also a valuable time to share news and updates within the team about the business. The hospitality workforce has had its fair share of challenges in recent months due to Brexit and other global concerns and team retention is important so we can build, grow and nurture talent. Having received a Gold Award for Investors in People in 2016, and named as one of the great places to work in hospitality this year, along with a team retention rate of 91%, the proof is really in the pudding when it comes to working for bartlett mitchell.